The bloody butcher knife is a great prop for Halloween. It can be paired up with almost any horror costume. Its realistic size makes it perfect for murder mystery dinner theatres. 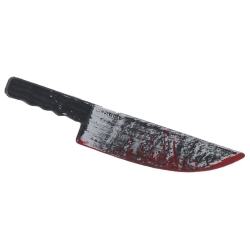 To give the knife a fresher more recently used look add a splash of stage blood to the knife. The bloody butcher knife measures 11" in length and is colored as pictured.